What will you do if God forbid, your house is destroyed by a quake or any other natural disaster? You can rebuild it simply by saving Rs 6-12 a day. 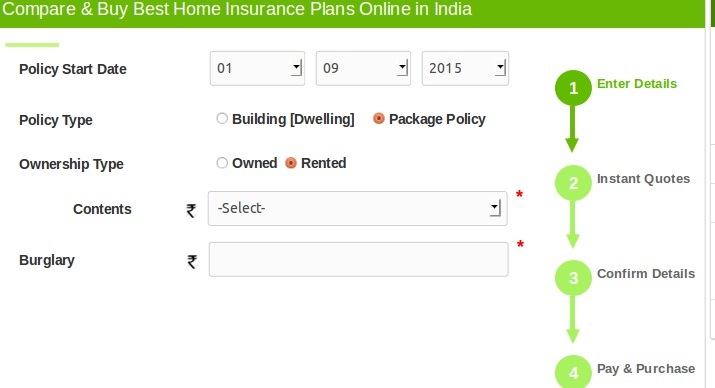 No, it's not a joke its just the average cost of a home insurance plan in India. Although majority of Indian people consider home insurance a needless expense, recurring events of natural perils are compelling them to consider home cover a priority. A home insurance plan covers the costs for rebuilding the structure, not the value of the property. Reconstruction costs do vary and for a no-frills structure the cost is around Rs 1,800 per square foot. It will cost around Rs 3,500 per square foot for a better construction. If you possess a 2,000 square foot residence you can insure your house for Rs 35-70 lakh. In that case, you have to pay Rs 2,100-4,200 for premium each year. You can reduce the cost by opting for a long-term policy with the tenure of 10 years. But you cannot predict the cost of construction and most likely the expenses will rise after 10 years. Why should you insure your home now? The recent incidents of repeated quakes created ripples in the domain of home insurance in India. Insurance houses from both public and private sector have witnessed an upsurge in enquiries for home covers. The conversion rate has increased accordingly as well. Here is a chart that shows the rate of increase in home policy quotes requests and purchase. Ideal Insurance Broking saw a rise 60%-70% in inquiry with an increased conversion rate of 50%. Insurers like National Insurance or Oriental Insurance that belong to public sector have also witnessed a hike of 50% in inquiry and a rise of 40% in conversion. Insurers from private sectors experienced even better response. Bajaj Allianz noticed a jump of 200% in inquiry and 220% rise in conversion. 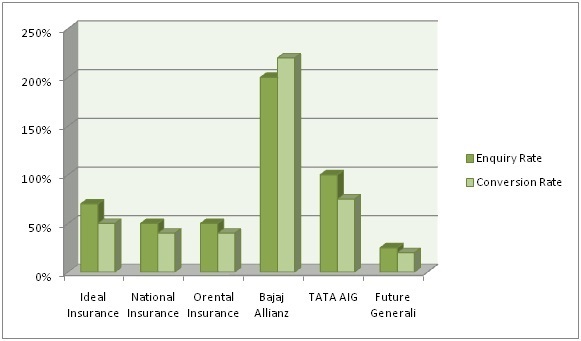 Tata AIG General Insurance observed a whopping 100% rise in requests for policy quote and also 75% hike in conversion. Future Generali, a new-born insurance company also marked increase in inquiry by a 25% and a 20% rise in rate of conversion. If you are planning to build your house or thinking of buying one now, you should consider buying a home insurance policy. In case you have precious household items it is wiser to go for a package. A package policy will have both your valuables and home building insured under the same plan. An online approach is best way to grab a home cover. Insurance comparison portals have made the complicated job of comparing various quotes lot easier and the best comparison websites also let consumers buy policies right from their websites. In order to make an effective comparison you have to keep some crucial factors in mind. These factors such as coverage, premium amount and other aspects of a home insurance package is determined by the ownership type. For an example, if you are the owner of the residence you live in you will get coverage for both the home building and the contents inside it. But, if you live in that house on rent your household items will be covered only. And the premium amount will also be determined accordingly. Regardless of the type of ownership, you can specifically cover your precious household items under a home insurance package policy. Here is a breakdown of the things that you can include under the coverage. The glass and sanitary equipment which are fixed in particular places inside the home will be covered. However, the plan doesn't cover movable glass equipment. This coverage is meant for various home entertainment equipment like television and its accessories, cable or digital or /satellite television receiver, Video equipment etc. The coverage is for mechanical and electrical gadgets and appliances that belongs to you or your family members and up to 7 years in age. Expenses for damages of these gadgets is covered if the damage occurs inside your home due to mechanical or electrical breakdown. The wide range of additional coverage further includes pedal cycle owned by you or any member of your family along with the accessories of the cycle that has been permanently fixed. If your baggage is damaged due to accident during a Journey your expenses will be covered under a home package policy. This coverage encompasses both temporary and permanent disabilities. People those who stay indoors and affected by accident will be covered only. Apart from these specific items, you can further insure your expensive belongings. In that case you have to submit the valuations of the items you want to insure. You can ask for coverage for jewelry, clocks, watches, furs, photographic equipment like camera and their accessories, musical instruments and sports equipment and their accessories. Depending on your requirement you can either select the 'all risk' section and put in the value of all your costly household items or you can opt for coverage for particular items. If you choose the latter you need to put in value of those assets that you want to be covered. 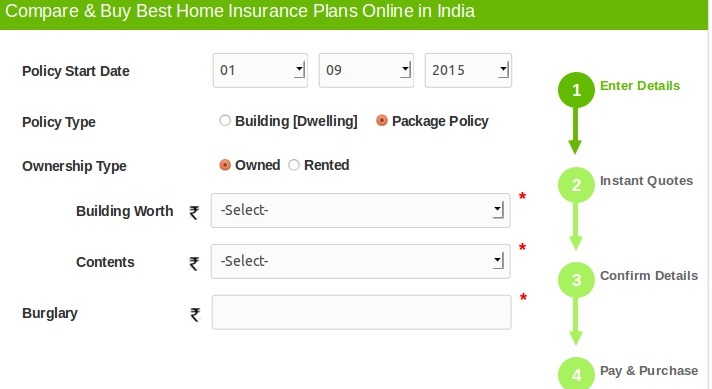 Now that you what coverage are available under a home insurance package policy, you are all set to make comparison of best quotes. If you want to insure your home for 50 lakhs and home contents for another 10 lakhs you will get burglary coverage for the same amount of sum insured for home contents. You can further go for additional coverage which is provided by some insurers and in that case it is better to specify the items that need to be covered. And the total valuation of the these items must not exceed the sum insured for home contents. You can choose to insure your personal computer for Rs. 50 thousands and your home entertainment equipment for Rs. 1 lakh. To remain on the safer side, you can also insure your public liability expenses for another Rs. 1 lakh. Once you submit all these details you will get to choose from 5 best home insurance quotes offered by eminent insurance houses in India. You need to assess premium amount along with various aspects of coverage before settling with any of these 5 plans. Once you get hold of these 5 policy quotes you can find the best plan out easily. If you go through these 5 home covers you can clearly see that each plan comes with pros and cons. Here is a summary of the strength and weaknesses of all 5 home policies. Royal Sundaram offers the lowest premium but they don't offer coverages for burglary and fire and perils. The plan covers electrical and mechanical breakdown up to 3 lakhs with a limit of Rs. 20 thousand per item. There is a coverage up to only 2 lakhs with a limit of Rs. 40 thousand per item for damages caused to home entertainment equipment. 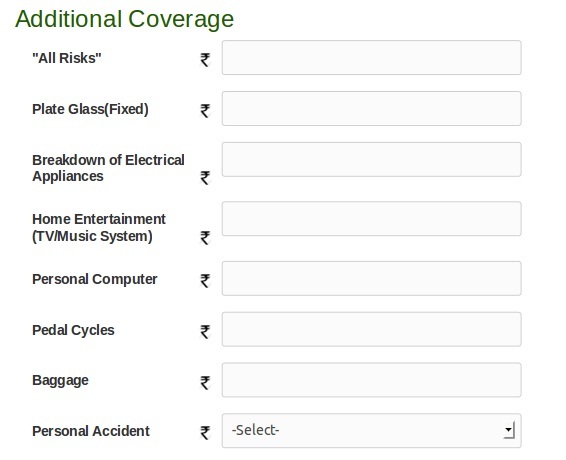 The 'all risk' coverage is also less than 1.5 lakhs with a limit of Rs. 20 thousands per item. The plan offered by HDFC ERGO also doesn't provide coverage for burglary, mechanical and electrical breakdown. The policy doesn't offer 'all risks' coverage and doesn't cover costly home entertainment gadgets either. It does cover fire and perils but only up to 30 years. The premium is also on the higher side without any significant coverage. The plan offered by United India Insurance comes with a higher premium. Coverage-wise the plan is not too bad as it covers expenses die to fire and perils for an indefinite period of time. Burglary coverage is also available up to Rs. 10 lakhs. The policy also provide 'all risks' coverage up to 33.33% of sum insured. There is not much to choose between the policies on offer by Oriental Insurance and New India Assurance. Both policies come with same premium amount of Rs. 7,248 and same coverage. The plan covers expenses due to fire and peril and electrical and mechanical breakdown without any limit. The 'all risks' coverage is available as well and you can get coverage for burglary up to 33.33% of sum insured. Earthquake is not the one and only fear factor, according to the recent Swiss Re. report floods in India in September 2014 destroyed hundreds of houses and caused a staggering 4.4 billion dollar loss. All these catastrophic incidents trigger the need of home insurance. You should not delay in comparing and buying a home cover. 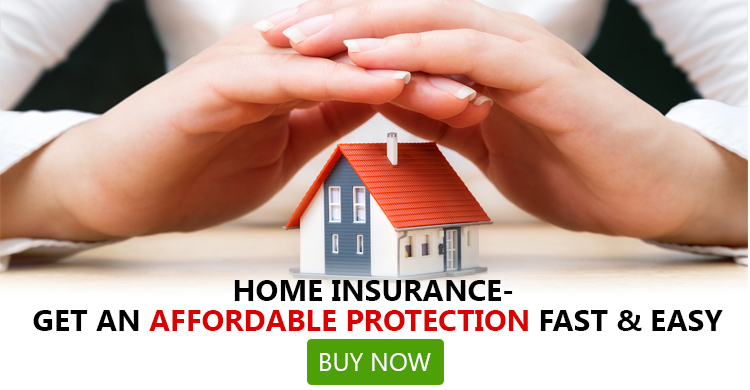 You can purchase a home policy from the comfort of your home through top home insurance comparison portals.